Dumbbells and barbells are as basic as it gets as they are used in a wide variety of exercises and as a matter of fact it is hard to imagine a proper gym without them. Adjustable dumbbells are ideal since you can add more weight as you become stronger. Certainly, you will need to invest in a set of weight plates for your dumbbell and barbell. You will also need to invest in a very high quality barbell because you will need it to do a lot of big movements like the squat, bench-press, deadlift and military press. Your barbell therefore needs to be able to handle the tremendous weight you will be adding to it as you get stronger. A POWER RACK IS A MUST! A power rack is key to be able to perform heavy exercises like the squat, military press and bench-press with a relative degree of safety. A huge drawback to a home gym might be the lack of a spotter to help you when you have difficulty with the weights. People have actually died performing the bench-press when they get stuck underneath the weights. Sometimes, it is easy to misjudge your capability in cranking out another rep or two with the bench-press and this could be fatal if you are exercising alone since no one can save you. A power rack can provide a safety mechanism so that you can bench-press to muscular failure without having to worry about getting trapped underneath the weight. Some power racks also facilitate you to perform bodyweight exercises like the pull-ups, pushups, and dips although these exercises can be performed anywhere and anytime with a bit of improvisation. For the most part, cardio machines are an unnecessary expense. You can get similar benefits by running around the block or park and if this is not possible for whatever reason, you can buy a good jump rope and do some skipping. There is absolutely no reason to shell out so much cash for a cardio machine if you do not have to. You could also invest in a heavy punching bag and do some boxing for the cardiovascular benefits. These creative methods are good or even better than buying a fancy cardio machine. 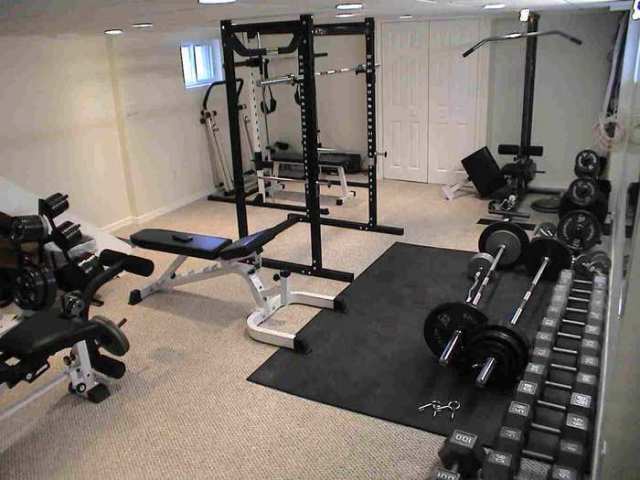 An overlooked but very important aspect of a home gym has to be the floor. Lifting and putting down all those heavy weights will not be pleasant to the ear. As such, for better atmosphere and to protect your floor you should consider layering the floor with plywood under a rubber surface to deaden the sound of the metal and prevent dents and cracks in your floor because this will greatly improve the conditions under which you exercise. Undoubtedly, despite the upfront expenses, a home gym is a wise investment that will save you time and money in the long run. By scouring the classifieds and doing intelligent bargaining one can get a lot of the basic equipment at affordable prices. It does not have to cost an arm and a leg to construct your own home gym if you go about it in the right way. Follow him https://twitter.com/GainQuick) on Twitter. This entry was posted under Exercise Equipment, Weight Training. You can follow any responses to this entry through the RSS 2.0 feed. You can skip to the end and leave a response. Pinging is currently not allowed.